I have been craving to have some Korean food while I was on a short holiday in Malaysia. My mom and I decided to head over to Da Sae Gwan which is at Sri Hartamas. I used to go there with my family because it’s like 30 minutes away from my house by car. I thought of wanting to go to Ampang where most of the Korean restaurants are there but it’s too far for me. I will go over to Ampang next time. So, back to what I was suppose to be talking about: Da Sae Gwan. I went over to Da Sae Gwan for lunch. It’s best to come around noon because (1) getting the parking space and (2) to avoid the crazy traffic between the highway and Sri Hartamas. Da Sae Gwan has been renovated into a more spacious and comfortable space. The tables with electric barbecue (not the charcoal one) and chairs are nicely placed so you will not feel cramped. After ordering what we want, we were served with a variety of “free” side dishes. Yes, these side dishes are free and you can ask for some more. You get to try a little bit of everything. From spinach to mini pancakes to beansprouts to kimchi and many many more. The best thing that I’m so happy is getting side dishes for free instead of being charged. The side dishes are light, with good amount of seasoning, and yummy slow food that compliments well together with rice and main dishes. Our first main dish is the Ox Knee Soup. 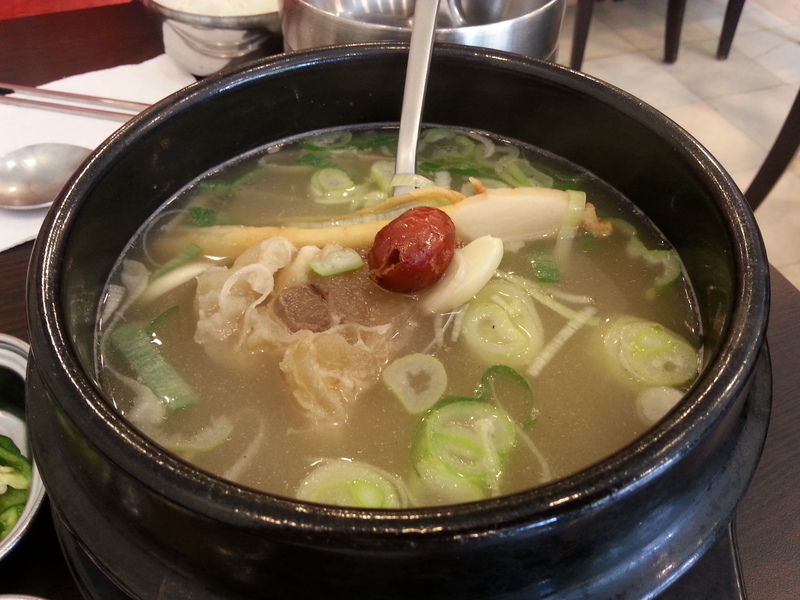 Even though the broth is meaty, it is light and herby together with red dates and ginseng. The ox knee is chewy and sticky at the same time but it satisfies my craving together with a bowl of white rice. To enjoy this soup, it is best to eat together with the rice because, like I said, the texture of ox knee is sticky. Next, we had the Samgyupsal (Pork Belly) together with “free” lettuce and green chilli peppers. Sadly, these meat were cooked at the kitchen before putting them on the hot pan. 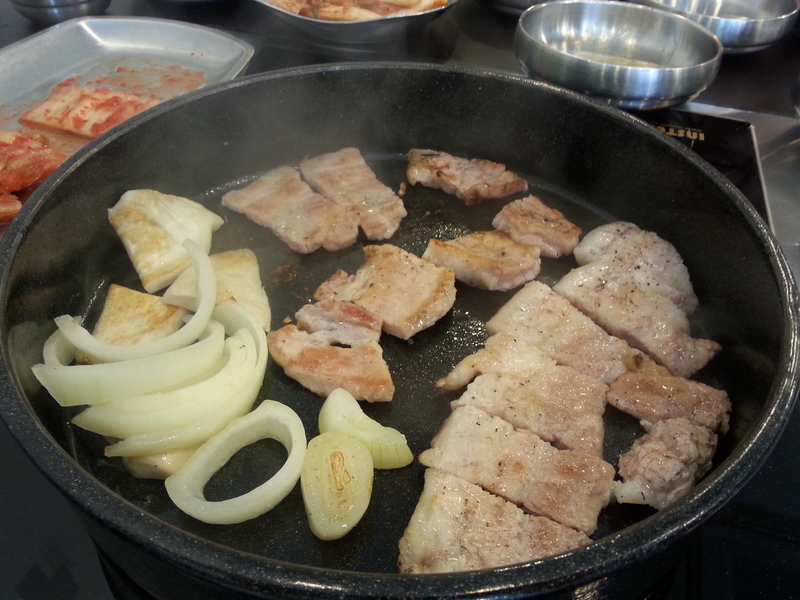 If you’re lucky, one of the staffs will cook the meat straight into the hot pan. The meat taste similar to what I used to eat numerous times. Nothing special. Eating together with the lettuce, rice, garlic, kimchi, and sauces is the perfect wrap that will make your tummy happy. Lastly, the grilled mackerel came and it looks beautiful. The mackerel is grilled perfectly as the skin is cooked till golden brown. After squeezing the lemon over the mackerel, it’s time to dig in. While tearing its meat, there’s a little bit of juice coming out which means its meat is not too dry. At the same time, the steam just came out from the mackerel as it just grilled nicely. Its meat is juicy with a bit of saltiness. 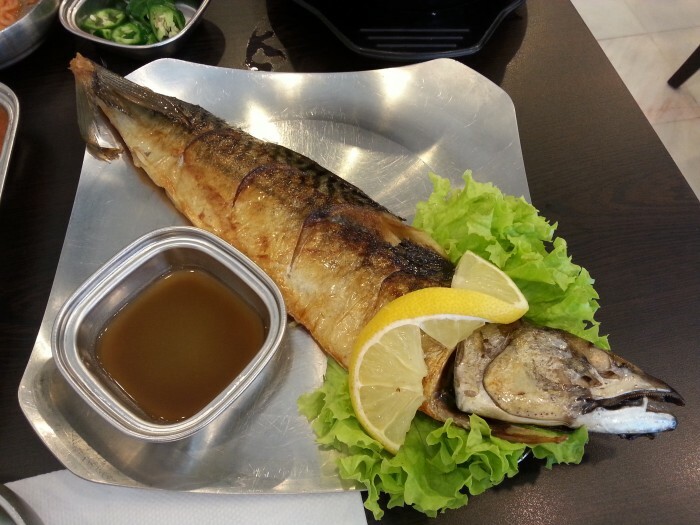 Also, thanks to the lemon, it is a bit sour but it balance the taste together with the saltiness of mackerel. If you want more salty or spicy, you can dip its meat together with the sauce or the soy sauce with green chillis. 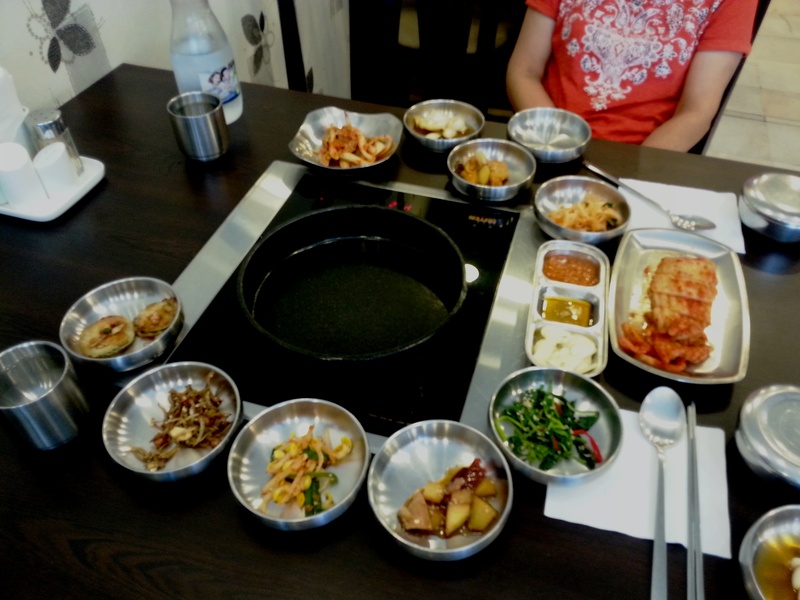 The lunch has made me so full but I was satisfied with the dishes except the samgyupsal. It is because I found nothing really special about the samgyupsal. Yes, the texture and taste is there but there is something actually missing and the fact that the meat is cooked at the kitchen before putting them on the hot pan. For a meal for two which has three dishes that costs about between RM50 -70 is a bit too pricey. When I checked the menu for Kimchi Jeon and Pajeon, each of them costs RM22. That is way too expensive. If it’s more than two people, then probably it will be a bit cheaper. For foreigners, then maybe it’s affordable for them to have a meal at Da Sae Gwan. However, it is worth the money as some of the dishes, which we had ordered, are delicious. I would come down to have them again but not always because of the price.